New York Times bestselling journalist John Stossel shows how the expansion of government control is destructive for American society. Emmy Award-winning journalist John Stossel is a self-proclaimed skeptic, attacking society's sacred cows. Now, he dismantles the most sacred of them all: the notion that government action is the best way to solve a problem. 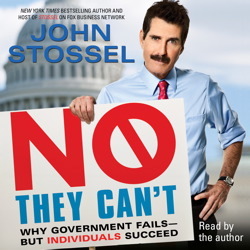 Utilizing his three decades in journalism, Stossel combines sharp insights, common sense, and documented facts to debunk conventional wisdom and challenge popular opinion about the role of our nation’s government. Stossel destroys liberal groupthink with economic principles and cites examples from recent history. Socialism always makes the societies it infects less free and prosperous. Keep it up, John!